Find 50% Off Selected Departments at Woolworths Online Whatever you need, Woolworths Online will have, and with a great discount! 30% Off Wine Sale at Woolworths Online Save 30% on your favourites this Easter when you shop this fab Woolworths Online offer! Free Delivery on First Orders Over $100 at Woolworths Online With your first shop at Woolworths Online, you can save on your delivery costs when you spend $100 or more! 30% Off Frozen Seafood and Fish at Woolworths Online - Perfect for Lent! Ideal for lent, you can now save 30% on frozen seafood and fish! Free Delivery on Orders Over $300 at Woolworths Online When you spend $300 or more at Woolworths Online, you can save on your delivery costs! Discover 50% Off Selected Bakery Orders at Woolworths Online Shop the amazing bakery at Woolworths Online and save up to 50%! Enjoy 50% Off Selected Snacking Specials at Woolworths Online Are your family frequent snackers? If so, this offer could help your stock up your cupboards for less! 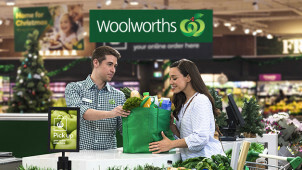 $10 Off Future Orders with the Rewards Scheme at Woolworths Online Check out the reward scheme at Woolworths Online where every dollar you spend earns you a point towards $10 off your next shop! 50% Off Household Products at Woolworths Online Get everything you need to keep your home running from Woolworths Online with a 50% discount. Woolworths is that trusty supermarket which offers an extensive selection of groceries and household goods to keep every area of your home in fine working order! From frozen goods for those quick meal moments to a bountiful bakery section to add something more to a morning breakfast or brunch - Woolworths offers variety and caters to a world of different tastes, needs and budgets too. Australia’s number 1 supermarket chain, you can rest assured that Woolworths always has its customers in mind. Convenience is the key at Woolworths, where you can find everything you need all under one roof. This is where you can shop cosmetics and bathroom essentials, all while you stock up on pet food and everything you may need for the month ahead. When grocery shopping is this easy, it leaves more time for you to experiment with your cooking, so why not get inspired on the ‘Recipes’ section and try out a few seasonal suggestions? With recipes from world-renowned chefs to explore, whether you’re in the mood for Mexican, French or Asian cuisine, you’ll find heaps of creative know-how to get you started. How do I use my Woolworths promo code? Choose the promo code you'd like to use, copy it and make your way to woolworths.com.au. Add the groceries you’d like to your cart and choose between pick up or delivery to continue. Log in or sign up and fill in all the details needed, depending on your chosen delivery method. Enter your promo code on the order summary page and continue to checkout with your discount. Choose a Woolies delivery pass and you’ll be able to start saving in a way that suits you! Does Woolworths have an app? Yes you can download the Woolworths app online and enjoy features such as Woolworths rewards, a store locator and more on your smartphone. You can find store locations and Woolworths opening hours online using your postcode or suburb in the search engine. Can I track my Woolworths order? Use your order number to track your Woolworths order online. Standard Delivery is free on all orders above $300 and otherwise starts at $11 for orders up to $149.99. Do check online for additional delivery costs. Should items be faulty or if you simply have a change of heart, Woolworths will happily refund or exchange your purchased goods so long as you have proof of purchase. Do check the full returns policy for exclusions. Send Woolworths online a message: newshoponline@woolworths.com.au. Woolworths is that all-round store which allows you to tick everything off your to-do list. Letting you shop groceries from your favourite brands, alongside household items, baby essentials and much more, your Woolworths promo code will help you stick to budget while you conquer your entire shopping list. Shop fresh fruit and veg, alongside dairy goods and pantry essentials, with so much choice on offer at wonderfully low prices, your home will be well stocked up in no time. You can sign up to the Woolworths rewards scheme to start earning every time you buy your groceries. Giving you 1 point for each and every dollar you spend online, in-store and at fuel outlets, this is a no-brainer to get something back from simply shopping for all of your essentials! Plus, by being a member, you’ll be on the list for special deals and exclusive offers via email, so you can just sit back and enjoy earning! If you’re organising a lunch or a dinner party, then Woolworths should be your first port of call. This is where you can get everything from liquor and thirst quenching drinks, to sumptuous chicken wings, seafood and more to fill up your barbecue. Save with a Woolworths discount code and stock up on all the ingredients you need. Now it'll be a breeze to keep your guests’ appetites at bay!